One of the many myths surrounding Don’s early years involves his association with a Portuguese sculptor called Agostinho Rodrigues (sometimes written as Augustino Rodriquez). 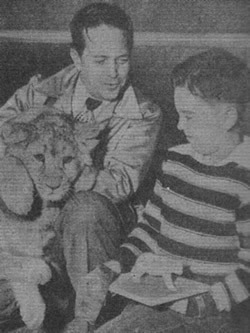 Don’s story is that he trained under this artist and appeared on a weekly television programme with him sculpting wild animals at Griffith Park Zoo. Searches for information about Rodrigues (using variations on the spelling of his name) have come to nothing. However, in 2003 a bit more about Rodrigues, Don and animal sculpting came to light. The Rhino art box Riding Some Kind Of Unusual Skull Sleigh included a book called Splinters, a collection of personal photos and other ephemera that had been selected by Don and Jan. Amongst this fascinating collection were three newspapers cuttings from 1951 that finally gave us some background and concrete evidence about the Don and Rodrigues connection. 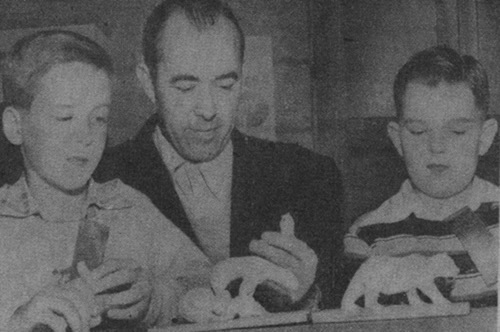 Donald Vliet (left), 9 year old sculptor, with the model which won him first prize among students of the Griffith Park modelling classes. With him is Peter Conway, 5, who won Achievement Award. 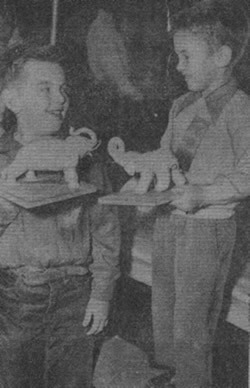 Both of these young Los Angeles sculptors exhibited models of elephants. Awards were made yesterday to clay modeling students at Griffith park Zoo by the City Recreation and Park Department. Don Vliet, 10, of 3467 Waverly Drive, won first prize with his entry of several clay models. Second prize went to Ronald Hill, 10, of 2689 Waverly Drive, while 6 year old Hugh Tower, 4940 Lindley Drive, took third prize. About 300 entries were judged. The models were made by more than 100 youngsters and adults, students at the week-end classes conducted by Agostinho Rodrigues on Sundays between 1 and 3pm. All modeling materials were supplied by the City Recreation and Park Department. With his clay model of a polar bear, Don Vliet, 10, at 3467 Waverly Drive, won the first prize blue ribbon in the monthly modeling contest at Griffith Park Zoo yesterday. It was the second straight blue ribbon for the Invanhoe Elementary School fifth grader, who has attended sculptor Agostinho Rodrigues’ free Sundat art class at the zoo for five months. Second place went to Roland Hill, 10, of 2689 Waverly Drive, Don’s fellow fifth grader who moulded his spotted leopard under Don’s exclusive direction. Ronald never attended the art class. Another ‘outsider’, Hugh Tower, 6, of 4940 Lindley Avenue, Encino, won third prize with a group that included a bear, two penguins, two birds and a monkey. [picture caption] PRIMES FOR NEW LAURELS – Getting a good look at Cleo, a lion cub, who will be the next subject of the monthly modeling content at Griffith Park Zoo, is Don Vliet, 10. Lad holds ribbon he just won and his prize clay model of a polar bear. Head keeper Charles Allen cuddles 5 month old animal. So, Agostinho Rodrigues was a real person and not a figment of Don’s fertile imagination (although it’s unlikely he’s still alive). He was a sculptor and Don did train with him. Whether this training consisted of more than the Sunday morning sessions for five months at the zoo is not known. 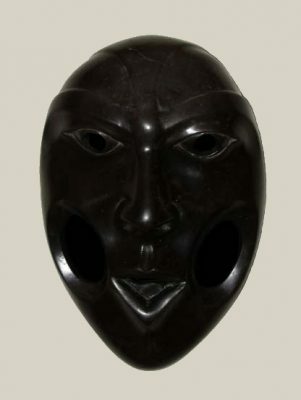 Then, in 2004 one of Rodrigues’s sculptures appeared on eBay. 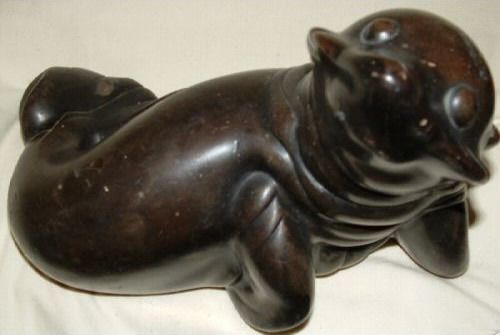 Interestingly, as can be seen, the sculpture is of an animal, a seal. It is signed and dated, 1954. A year later another of his sculptures, this time of a horse dated 1953, was also sold on eBay. (Unfortunately I’ve lost the images I had of that sculpture – although, I think, it may have been the same one as pictured below). The claim about the television show has still not been verified one way or the other. No trace of a programme has been found. Even if it did happen it’s very unlikely such a programme would have been recorded. It would almost certainly have been a live show broadcast on a local station sometime around 1951 – 1953. No record of it is likely to remain. Unless someone comes forward who actually saw the show or was involved in producing it, and that’s unlikely now 55+ years on, this is one story we’ll have to take Don’s word for. In July 2010 I was contacted by Filipe Ornelas whose grandfather had met and become friends with Agostinho Rodrigues in the Azores during the late 1930s. It seems that Rodrigues’ parents were originally from the Azores and had emigrated some time earlier to the USA. Rodrigues visited the Azores to see his parents home town. As a sign of his friendship Rodrigues gave Filipe’s grandparents a sculpture of a family of penguins … the smaller one representing Filipe’s father who was about 10 years old at the time. The sculpture is signed underneath and dated 1937. 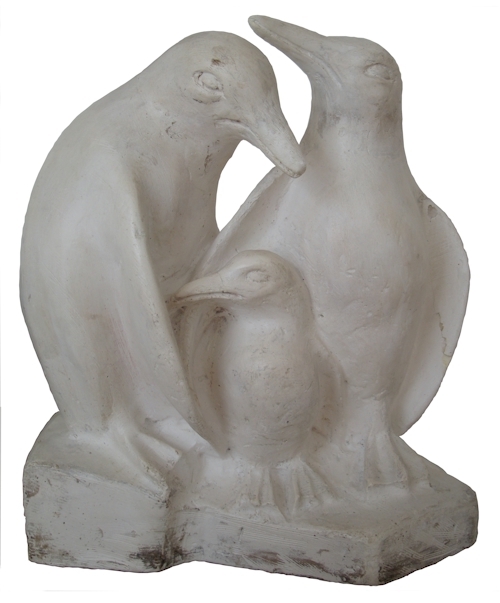 This charming piece is in plaster 33cm high by 22cm wide. Thanks to Filipe for sharing this with us. 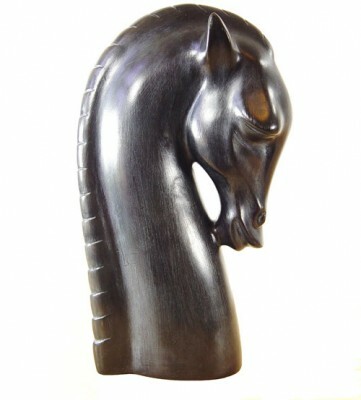 Thanks to Judson Kemsley for sending us a photograph of this exquisite sculpture of a horse’s head. It is signed and dated 1953. Size: 33cm x 18cm x 10cm. Unknown medium. A few years ago someone contacted the Radar Station as they were also on the trail of Rodriquez and had created a web page showing several of his sculptures. Unfortunately that web page didn’t last long and the person doing it is no longer contactable. So, if that was you and you’re reading this please get in touch again and let us know how your search is going. Tino was my uncle, we can help you with quite a bit of his history. Feel free to get in touch with me. I’m sure that whatever I can’t answer my father can. We would be happy to help in anyway. Uncle Tino was a remarkable man. My name is Greg Davies and I’m assistant professor of Art History at McMaster University in Hamilton, Ontario (Canada). I’m currently researching Don Van Vliet’s art and I would be interested to learn more about Agostino’s career and his work at the City Recreation and Park Department. I wonder if you might be able to assist? Most data therein is trustworthy, but some tidbits are likely exaggerated (“his family was extremely poor and lived in a small hut with a dirt floor”) and there are a few errors. He was then 55 years old (not 54) and he did obtain a grant by the government of Portugal to study in the United States, but not as stated at the end of World War II, but in 1940. As a young man in Madeira he also worked as a cartoonist for satirical newspaper “Re-Nhau-Nhau”, published in Funchal. Unfortunately I’ve been unable to verify this info. Ucle tini lived in Washington state when he passed away. Tino*…and from the family stories told growing up…that’s not an exaggeration. He started of extremely humble beginnings. That’s probably why I was able to get one of your uncle’s carved gorillas at a market in Seattle. It’s beautiful. I discovered a sculpture that my late husband bought and it says agostinho rodrigues 1952 its of a man with a coat and a hat , the hat seems like the one that the postman used…. color brown….. and in front of the statue has “period 1910” can you tell me something about it ? thank you. (i can give you contact info offline of these posts if you email me separately at smurray@mgm.com). correction about the time Jean Keith Murray worked with Agostinho: it was late 50s to early 60s…met Agostinho through VA …dad hospitalized and doing work with clay in hospital art department when Rodrigues visited. Dad ended up working with AR after that and built a “shed” as dad called it, for AR to do his fabricating and dry his molds. Dad talks enthusiastically about the glass crushing system and fabricating replicas of museum pieces with AR. I’ll ask my dad. The oldest photos I’ve seen of uncle Tino are late 60s but dad may have more than I know about. He did love his clay! It was an ever present medium. One of the last times I saw him before he passed I had a friend with me and it turned into an impromptu lesson in clay and sculpting. I recently acquired an original of Agostinho Rodrigues signed 1953. It is a beautiful black horse head 13″ in height. I am interested in as much information as I can gather. It is a beautiful piece and one I am proud to have in my collection. Hi Judson, my name is Miguel. I got a statue of Agostinho Rodriguez, i got the certificate of authenticity, and I want to ask you, if you could be interested about to buy it..Its beautiful…Its a head like an Asiatic soldier..Thanks.. any question, you can contact me by email. I live in California EU. I’ve been very curios about my sculpture. So thrilled to have found this page. I have a signed and dated rooster that my father gave me years ago. It is an original as well. I would be very interested in learning more about Agostinho. My father owned an auto body shop in Culver City, your uncle was a customer of his. He gifted it to my father after he had some repairs done. It’s beautifully sculpted, I’m proud of it as well. I have a lamp signed Agostino Rodrigues 1958, a symbol next to date and the numbers 502. The base is a sculpted head which I would describe as as Asian in appearance. I first thought Bhuddist in nature but not so sure. Sculpted base is approx 14 inches. It sits on a piece of granite atop a carved wood base. I’ve never seen anything like it. I believe my aunt purchased it. She enjoyed art and lived in San Francisco during that time period. Too bad no info exists on thus artist. Tino was a friend of my mom and dad. We lived in Mar Vista. My dad used to take my brother, sister and I over to his studio. I have a photo of Tino and me circa 1961 in his back yard studio. I was 7 yrs old. He asked me to pose for the photo on a giant bear that he had sculpted for a park. I wish I could post it here. It is a nice photo of Tino, myself and his bear sculpture. Tino used to come to our house for lunch on Sunday. I have one of his horse sculptures like the one posted above, only it is covered in gold leaf. I remember well his studio with the coragated tin roof, the smell of fiberglass and resin, and all of the molds made of rubber. He was such a nice man, and he was really nice to us 3 kids. I also remember his white station wagon with the tail fins! I would love to see that photo! My dad, Jean Keith Murray, worked for Agostinho in the early 60s, before working for sculptor Howard Ball. Dad started by building a small enclosure for Tino, then helped with the processing (the glass grinding bit and some design work)and finish work on items made for the Studios and Vegas hotels. My dad had epilepsy, but was a gifted craftsman and got work with other artists because he was also a mix of scientist/builder/craftsman/artist. As such he was always fascinated with Agostinho’s process. I would like to see the environment he spoke about, one of the last places he worked before moving to Alaska to homestead in 1968 where he fashioned a few pottery pieces from the clay he got from river banks! Thanks for reading this and hoping we can connect with a photo and perhaps other anecdotes. You and I are about the same age (i was born in ’56) and my dad had a son with a new wife in 1960 (my brother Bob), a baby when Dad worked for Tino. I did not grow up with my dad and only found him again in 2013. So even though you may not ever have seen him, even a photo that just shows the area he worked is something of a connecting dot as I put together my Dad’s bio :) …Thanks in advance and you can reach me at the email smurray@mgm.com. My name is Gene Levin and I was born in Hollywood,CA in 1955.
black suit and bow tie who would be standing outside the cage speaking about the origin and feeding habits of the particular subject being sculpted. Periodically,the man would say ” And now,let’s see how our little friend is coming along”…the camera would then focus on the young boy in the process of forming and finally completing his sculpture. I never knew at that time that the boy sculptor was Don Vliet and the adult the Portuguese sculptor Augustinho Rodrigues,but I remember that when I was 5 or so in 1960 I would tune the show in on our black and white television after having watched a morning childrens show and some cartoons. at a performance at The Keystone Theatre in Berkley,CA. I had a concert bulletin with his photo that I pulled off a streetlamp,many were posted.I spoke with him a few minutes,then we sat at a table and he drew me a picture of birds and animals with a ballpoint pen which he and his wife Jan then signed and dated 4/24/77. I still have that drawing. So glad to have had these experiences.I thought you might like to hear from someone who can confirm that Don Van Vliet meant what he said about sculpting at the zoo on a television program. Happy New Year, Gene Levin. 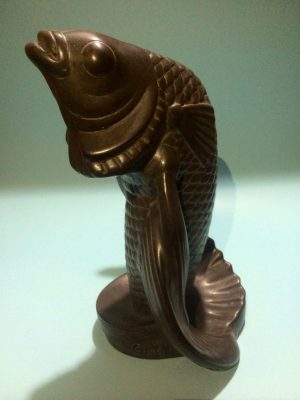 I was in a giant antique mall in Wichita, KS searching for Oriental antiques and way in the back, on a shelf amongst some old dishes and plates, was the most beautiful sculpture of a fish. It was Asian in appearance and since I am drawn to Asian arts and antiques I purchased it immediately. It was quite a bit of money for a dusty fish sculpture but I just had to have it. I took it home, cleaned all of the dust off of it, and noticed the signature towards the bottom of Agostinho Rodrigues along with a date of 1951. I tried to research the artist and was able to find almost nothing about him. I came across the website and am very pleased to discover that there are others in my same situation who are searching for information on this very fine, although somewhat elusive, artist. I have a very nice statue carved from wood signed by Agostinho Rodrigues dated 1952 with a symbol. The primate looks like the kind from The Planet of the Apes and is sitting in a position with deep thoughts. This piece came from a man who traveled many countries. He was an engineer for York International. I am so glad to have found this site and am enjoy learning more about the artist. Like others here I am fortunate to have found this website. 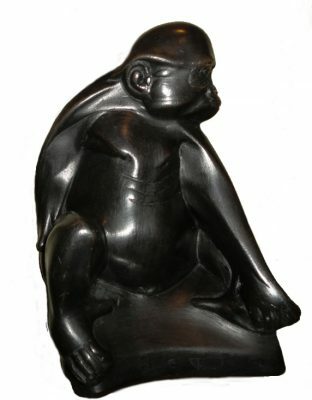 Have been trying to find information about Agostinho Rodriquez whose signature graces his gorilla carving (1952) with the number 302. Are each of these one-of-a-kind with the number representing the specific carving? Any more information would be appreciated. I believe it would be a great thing if someone created a website for him. We, in turn, could then send pictures of what he carved. He’s an under-appreciated great artist. I’ll ask my dad. The oldest photos I’ve seen of uncle Tino are late 60s but dad may have more than I know about. He did love his clay! It was an ever present medium. One of the last times I saw him before he passed I had a friend with me and it turned into an impromptu lesson in clay and sculpting. As for the gorrils…my father may have the mold for that piece. We have several of the mold he had left when he passed. We were given two gorilla sculptures by an artist friend. They are signed by Agostinho and dated 1951 and 1952, respectively. They are also numbered, implying there are other reproductions. They are wonderful. Can anyone shed more light? Thank you. I have a signed piece from AR dated 1955, and number 704. It is a big hand, Palm up, looks almost like wood, but the thumb had to be glued back on so I noticed it is clay…or plaster maybe? I have 9 of his art albums. He and my great aunt were together up until their deaths. If you interested in them let me know. It includes quite a few news articles related to his life and thoughts on sculpting.